Walt Whitman’s celebrated 1855 poem Song of Myself was an astonishing new poetic venture in its language and style as well as in the values and spirituality it expressed. The poet, Whitman believed, was to be the high priest of a new, democratic religion. Whitman was inspired by the progressive religious ideals surging through Quakerism and other spiritual movements. 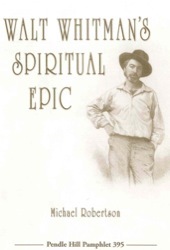 Quaker scholar Michael Robertson writes, “This lengthy, brilliant, and endlessly suggestive poem is Whitman’s masterpiece, the single greatest poem in American literature, and the starting point for anyone interested in Whitman’s religious ideas.” With particular attention to the perspectives of Friends, Robertson walks the reader through Song of Myself, noting its beauties, its challenges, and its deep inspiration.